1) Choose your pipe. There are many different styles and materials to choose from, and different pipes do smoke differently. Pipes are made from four different materials, however, in order of expense: Corncobs, hardwood, clay, briar, calabash, and meerschaum. 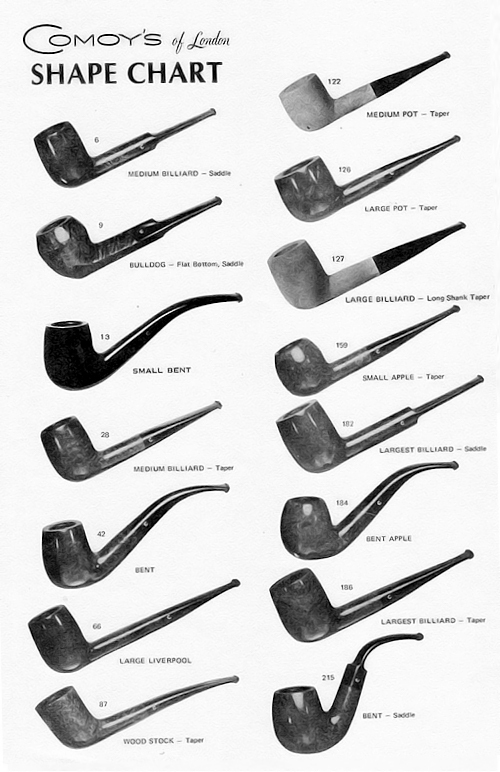 Also, there’s a vast variety of shapes and stems to choose from; this can be a bit overwhelming when looking at pipes made from briar or meerschaum. Find a pipe that appeals to you. Like many things; it can be honestly said that a pipe will choose you, versus the other way around. However, if you don’t have time (or a tobaccanist nearby with a wide selection of pipes), starting with a corncob is easy, cheap (sometimes $4.00 versus a $40 estate briar or a $240 Meerschaum), and they smoke fine enough. (if you’re super crafty, you can even make one yourself). Different bowl shapes, as well as different materials have different effects on the smoke or temperature of the smouldering tobacco, which we won’t get into here. The point is to find one you like, that matches your taste. Oh, and as awesome as churchwardens look (those are the ones everyone smokes in Lord of the Rings, with the very long stem), they can be difficult to clean, and cleaning is very important for your pipe. They are also very fragile, and hard to store properly. I don’t reccomend one of those for beginners. -Aromatics: These blends typically have some additives, in terms of flavor. This creates a stronger, delicious-smelling tobacco. These additives are usually chocolate, vanilla, various fruits, or liqueurs. They smell good, but don’t always taste the best, but if you’re worried about a spouse, or how a house might smell, these are probably the way to go, and most people start on these. The tobaccos in the group of aromatics are specially fermented using a process called Cavendish, which…we won’t get into here. A major drawback is that they smoke wet, and it’s harder to smoke a whole bowl at once. Think of these like a white wine, or a lighter red like Grenache, if we’re going to compare these to wine. -Virginia/American Blends: These are intermediate, often pressed as dry flakes or blocks. There’s a lot of different types of Virginias, even as many as nine of them in a blend. Often also Perique is included in a lesser amount, but never Latakia. Because they are often in flakes or blocks, they do tend to age well. if these were a wine, these would be like the Bordeaux blends of Cabernet Sauvignon or Merlot; the run of the mill, good for any occasion. -Englishes/Balkans: like Virgina/American blends, these normally include no artificial additives. Usually they contain as a vital ingredient strong and smokey Latakia coming originally from Syria, or again Perique, which is also dark and spicy-a special type of aged tobacco coming from Louisiana. These are known for strong flavors, and one of the richest smokes. These sometimes come across as pretty heavy. Think of it as a Tannat or Barolo, versus the Virginia/American style which would be like a Cabernet Sauvignon. Said blends are a mix of different styles of tobacco, and we’re not going to get into those currently. Admittedly, sometimes I like a little of everything; different blends for different moods or even different pipes, and circumstances. When sitting out in the town, I prefer Englishes or Balkans, if I’m indoors or around people who might complain, I go for aromatics. Striving to be an Orthodox Christian gentleman winemaker in an often crazy world. And wine critic. I also dabble in geology. Virginias age amazingly because of the sugar content. So sugars in tobaccos are equivelant to tannins in wine? This is good to remember. Pipe smoking is still bad for you. Q.E.D. Everything is bad for you in some sense. Must we rehash this argument?